Uber says it plans to focus more on its electric scooter and bike business, and less on cars, despite the fact it could hurt profits. He also forecast users would make more frequent shorter journeys in future. "During rush hour, it is very inefficient for a one-tonne hulk of metal to take one person 10 blocks," he told the Financial Times. 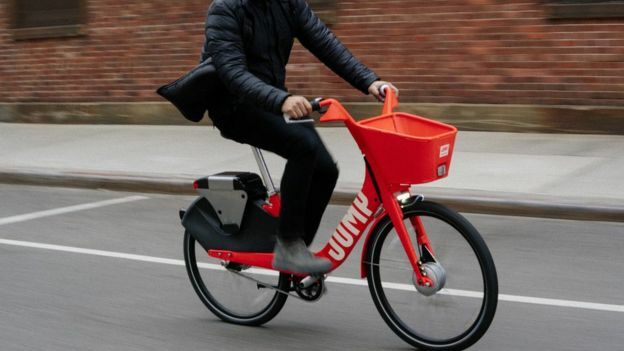 It also teamed up with Lime, an electric scooter company, while forging deals in other areas such as public transit and freight. Mr Khosrowshahi admitted that Uber makes less money from a bike ride than from the same trip in a car, but said this would be offset as customers used the app more frequently for shorter journeys. "We are willing to trade off short-term per-unit economics for long-term higher engagement," he told the FT. He also acknowledged that Uber drivers could lose out from the plan, but said over the longer term drivers would benefit from more lucrative longer journeys. Uber, which lost $4.5bn (£3.5bn) last year, is under pressure to improve its finances ahead of an anticipated public listing. Revenue from its taxi business is rising but the cost of expansion into new areas such as bike sharing and food delivery has meant losses have grown rapidly. Regulatory pressure is also threatening growth in some markets. This month New York voted to impose a temporary cap on new licences for ride-hailing vehicles to tackle congestion, while the mayor of London has said he will seek similar restrictions.